The 26th Festival of Chinese Martial Arts and Open Tai Chi Championships took place the last 13th of April in the city of Oxford. Many schools from all over the United Kingdom gathered at the Blackbird Leys Leisure Centre to participate in the Championships. In a friendly and open atmosphere, styles like Yang, Cheng and Wu were displayed at the Tai Chi areas. Wuzu Quan, Tang Lang and Bagua were performed in the external sections. In the Tai Chi Weapons section competitors displayed Sword and Spear, and at the external Wushu section the Staff and short stick were also displayed. 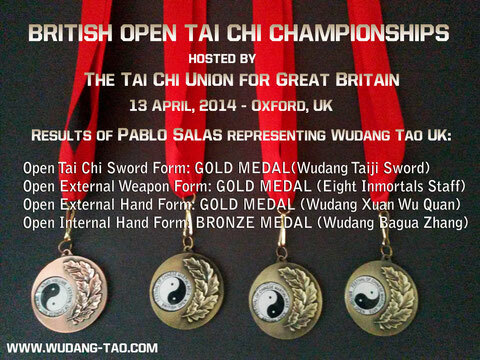 Pablo Salas took part representing Wudang Tao and the original Wudang style. Came home with 4 medals - 3 golds and 1 bronce.